Keep in mind, the Conservatives exceeded their final poll numbers by 2-3 percentage points in 2008. Whether or not that happens again remains to be seen, but they do have the best ground game and the most incumbent candidates. Their vote also tends to be older and, I suspect, is more likely to turn out at the polls. But that's all conjecture on my part - the exercise here is to make projections using the data on hand. Using the vote numbers above, I've simulated the election 10,000 times. These simulations factor in results from the past 3 elections, the demographics of each riding, by election results, and incumbency advantages. Each simulation looks at how regional shifts traditionally transfer to the riding level - after all, if the NDP vote jumps from 12% to 36% in Quebec, it doesn't mean their vote will increase by 24 points in every riding...and it doesn't mean their vote will triple in every riding. This is why the simulation model is, in my humble opinion, superior to all other models out there. It doesn't say the Tories will win a given seat - it only says they have a 70% chance of winning a given seat. Finally, when running the simulations, I also consider the fact that the polls could simply be off the mark, as they have been in some recent elections. For the long and boring explanation of this methodology, click here. I would love to tighten some of those confidence intervals up, but the reality is this is as close to certain as we can be given the public polling data on hand. Quebec is a complete wild card this election, since there isn't a projection model out there capable of saying what a 30-point jump in NDP support actually means in terms of seats. All 10,000 simulations had the same order of the parties, with the Conservatives winning a majority 28% of the time. So we may have to stay up late to see whether or not Harper gets that long sought after majority...or at least is close enough to "top it up" with a few floor crossers. Now, what I like about this simulation model is that it's 100% data driven. I haven't arbitrarily decided who is or isn't a star candidate, or tweaked the model to get the results I want. So like all seat projection systems, it should be used as a tool to make predictions, not as a prediction in and of itself. I may be wrong, and that's cool if I am. It wouldn't be the first time. By all means, make your own predictions below, and I'll be sure to give a special shout out to whoever is closest to the mark. posted by calgarygrit at 12:29 a.m. So you are predicting what you called Ignatieff's "nightmare scenario"? So what do you think will happen then? Will he back Layton or Harper for PM? Layton would almost surely offer Liberals cabinet spots in a formal coalition with these numbers. So that would be 137 seats which would be considered close enough to Harper's 146. Do you think Ignatieff will resign as leader if they only win 55 seats? By Anonymous, at 1:01 a.m.
With the numbers I'm predicting, CPC > Lib + NDP. Given that, Harper pretty much stays on as PM. He likely cuts a deal with the Bloc on the budget, since they'd be in no shape to fight an election. By calgarygrit, at 1:04 a.m.
Oh that's right Harper has no shame, so he probably would do that. I guess that arrangement could work for another year or so, but you got to figure that calls for Harper to step down start to arise, his base would not be pleased with being reliant on the separatists for survival. Harper will face a leadership review next month incidentally. I suppose that benefits him as it gives no one else time to organize against him. By Anonymous, at 1:09 a.m.
Do you think Ignatieff will stick around with 55 seats AND pass a leadership review though? By Deputy Dan, at 1:13 a.m. I am really not sure how advanced polls impact the polls. Since the world of Easter weekend was markedly different than the world of May 2nd, that could depress NDP support. As could strong Tory GOTV, or the stronger vote commitment by Tories. On the other hand, the NDP actually does surprisingly well among all people certain to vote. Moreover, a large number of Liberals and Greens have indicated they might change their minds. Also, pour a 40 on the curb for my poor Liberal homies. By hosertohoosier, at 1:14 a.m.
By Atypical Albertan, at 1:17 a.m. Right or wrong, some certain people will be voting in a somewhat lighter mood all day after waking up to the big news. My fifty bucks on Jack looks even stronger. Don't care who wins; been AWESOME to watch it happen tho! By Jacques beau verte, at 1:19 a.m.
Deputy Dan, since the Bloc is poised to lose Jeanne-Le Ber (which contains McAuslan Brewery) I'd use Unibroue for the Bloc. It is located in Chambly, which I'd figure as a Bloc hold. By hosertohoosier, at 1:22 a.m.
By Jacques Beau Vert, at 1:26 a.m. I don't think the advance polls will have a huge impact, since I would guess people who vote in advance polls are typically those who have made up their mind early. Of course, there will be some who vote early because they'll be away on E-Day, so I guess that might hurt the NDP a bit as they've continued to grow over the past week. By calgarygrit, at 1:37 a.m. I'll add that, either way, the NDP's results in Quebec will give us a fascinating case study about the importance of the local campaign versus the national campaign. I've got them at 38.6% on the polling average. I'll be curious how much of that they hold, compared to their "poll" vote in ON or BC, where they have stronger organizations. By calgarygrit, at 1:39 a.m.
83 seats for the NDP, eh? That'll be the most seats ever won by a non-moderate party. Canadian Alliance got 66 in 2000. Why are people voting NDP? 1. They perceive Jack Layton and the NDP as more honest and ethical - and didn't do any research to see if that was true. 2. Are sick of the status quo and politics as usual, desperately want a change, and feel they have no other place to park their vote. 3. Think it would be fun to be part of a movement, part of something historic. To fit in, say they voted NDP, give everyone high-fives, laugh and push each other into the bushes. Personally it's a real pity. But it could be worse! Plus, let's see what actually happens. I still reckon some of them won't actually bother voting. But that's what I thought about Nenshi's vote, too. By Robert Vollman, at 1:45 a.m.
By Anonymous, at 1:46 a.m.
based on your numbers and others: CPC 145, NDP 78, Lib 58, BQ 26, Ind 1, Green 0. I hope all those poll numbers and mine are wrong however. 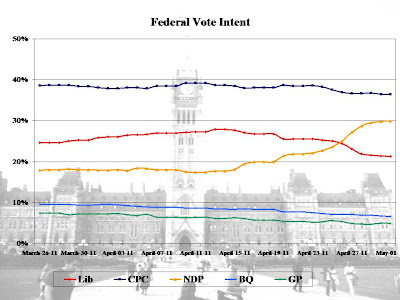 I believe NDP have a weaker ground game and CPC are somewhat less motivated to get out than last time. I also expect some of that Liberal/progressive vote that stayed home and more youth vote comes out. By DP, at 2:18 a.m. Thanks Dan, and H2h, and others, for qualifying your predictions appropriately; too many of those who gaze at entrails don't do that! By Party of One, at 2:26 a.m. I think Andre will lose and no Independents will be elected. I am actually pretty iffy on that lone Green but between May and Carr they at least have a shot at one MP. I do agree that they largely blew their big opportunity in 2008 when everything went their way (debate inclusion, environmental theme to election, Dion's support, and a less polarized electorate) but May decided to run in an unwinnable. This could very well be their last shot, unless we get some form of proportional representation, so it is make or break and running hard in BC makes sense. Robert, I don't think the NDP surge is any kind of vote park. That is not to say that it is necessarily reliable, what with the youth an limited ground game, just that it is representative of real support. In my opinion the key to the whole thing was really Quebec. Basically half of the national NDP rise, something like 6%, is entirely from the Quebec numbers. As soon as that happened, the NDP became a viable. They were suddenly both a truly national party and a realistic threat for achieving power. I think this inspired voters in English Canada who had previously largely been favourable to the NDP, yet had voted both Liberal and Conservative because they were the ones "running for government", to feel comfortable in voting for their first choice. This is not to underestimate Layton's impact; he ran a fantastic campaign and was able to marshal much of the existing anti-Harper mood in a way that Ignatieff did not. That said, I largely see this as structural as opposed to anything else. The question then becomes, why did Quebec move? I am not going to claim prophetic powers here. I had no idea that it would happen during this campaign but the signs have been there that eventually the NDP would catch a break and take much of the Bloc's vote. Sooner or later Quebecers were bound to either separate or vote ideologically instead of on the narrow theme of Quebec's place in confederation. This already began in 2006 when rightwing soft nationalists broke for the Conservatives. That aided the Bloc's transformation. They were no longer an "ad hoc rainbow coalition". Under Duceppe, they became as much a social democratic party as Quebec's party. Duceppe even campaigned broadly on allowing Quebecers to stop Harper by voting for him instead of for doing it for Quebec's independence or "rights". When that was the reason to vote Bloc, then people might as well vote NDP to achieve the same purpose while directing government policy. Perhaps the Bloc could have survived, becoming the CSU to the NDP's CDU, if they moved away from separatism and opened themselves up to partaking in government but they did not do so. Now we have Quebec social democrats voting for a Canadian social democratic party. That makes a great deal of sense to me. By Robin, at 2:44 a.m. The Dippers (and their CCF forebears) have been social democrats since before many in Quebec were. The problem is that the NDP was seen as a party of centralizing, English social Democrats. Jack Layton changed that perception by moving starkly towards a more decentralist position. This realigning period in Canadian politics may not be finished yet. While national unity and federal-provincial issues have a low salience currently, the NDP will be vulnerable in English Canada if such issues rise again (eg. if there is a debate over the constitution, or if the return of the PQ reignites the sovereignty debate). Multiculturalism is a second potentially tough a issue for the NDP, which will need to keep ethnic nationalists in Quebec happy, while maintaining the support of the immigrant communities necessary for viability in Canadian cities. We could have a revival of the Liberals in such an environment, or may witness adoption of the Trudeauite centralizing mantle by the Tories. By hosertohoosier, at 2:57 a.m.
Oh and on the Bloc's GOTV success. I do not have great confidence in it, hence my prediction of 14 seats. It just seems like it may be quite difficult for the Bloc's borrowed PQ machine to still target Bloc voters without themselves delivering NDP supporters to the polls. I imagine that much of the NDP vote is composed of former and future, unless Quebec Solidaire has its own surge in the next provincial election, PQ voters. Not necessarily the voters who would be targeted in a referendum but the kind who reliably favour the party as the leftwing statist option versus the more pro-market Liberals. Both the distinction between the Bloc and PQ as well as the fact that it is the PQ base going NDP could cause serious issues for the Bloc's electoral chances. By Robin, at 2:59 a.m.
Why the sudden rush to Layton? Besides the usual lot of NdPers and sympathizers (which may have stagnated prior to the surge) a good portion of the electorate obviously wanted none of Harper, and were looking at the next most best option -- except the Liberal leader was a victim of character assassination. Despite a solid platform, a very solid campaign, they just couldn't get past the images they'd swallowed over the previous 2 years. Hence, negative advertising worked like a charm, especially when it isn't countered early. Layton is a likeable sort and had suffered from his party's image in the past; now framed as a real option (as it should have been - i consider some of the framing the Liberals have taken over the past decade if not longer to be flawed and taking the electorate for granted) he caught the wind under his sails. By rockfish, at 3:02 a.m.
First of all, kudos to CG. Been great to follow this blog. I've been NDP since back in Broadbent's day and for the first time I can predict 100 plus orange seats without someone immediately calling the local psych ward, and I ain't letting that opportunity go south. I'm throwing up the Hail Mary pass. I'm not saying it'll be caught, but I'm hefting it down field anyway. I don't think it will a good night for independents or the Greens. There is some method to my madness. I don't think GOTV will matter much in QC, and if the Dippers can get a perfect storm of vote splitting and giddiness in ON, then we just might see something truly transforming. If not, it's been great fun trying. Have a great E-Day all! By Anonymous, at 5:31 a.m.
By Hishighness, at 7:31 a.m. This election is so difficult to predict. Generally I don't agree with Election prediciton project but for some reason I think they could be correct with their 145-65-65ish prediction. I know that doesn't jive with the stats and the polls but riding by riding I see it difficult for the NDP to sweep or the Libs to get clobbered. If the Libs are going to get seriously demolished (e.g. 40ish seats) then I think we'll have a Conservative majority. I still don't think that a Conservative majority is not out of the picture, particularly if NDP strength is even more centered in Québec than we already anticipate. By Marc from soccer, at 7:43 a.m.
1) Harper comes back with more MPs than before. So he is more entrenched than before re: base. He just needs to keep running the show like he has for the past 5 years. 2) We committed to GST harmonization payments to Quebec. Gilles will be satisfied with that commitment enough to avoid an election at all costs. Ergo, we will continue to run an un-fettered majority thanks to the Bloc by not making a single compromise. Good deal. Conservatives should spend that time wooig blue Liberals. Blue liberals, why very good Liberals, will not make very good Democratic Party liberals. This courtship needs to be at the citizen level and MP level. Blue Liberals in cabinet would be an excellent gesture of how seriously we value blue Liberals. Afterall, it would cement a socially moderate, fiscally conservative party in Canada - ultimately this country's most enduring coalition. By chuckercanuck, at 7:49 a.m. I think the GTA is going to crumble to Harper thanks to the vote split. By Deb, at 7:56 a.m.
Actually mine are pretty close. By Miles Lunn, at 8:22 a.m. 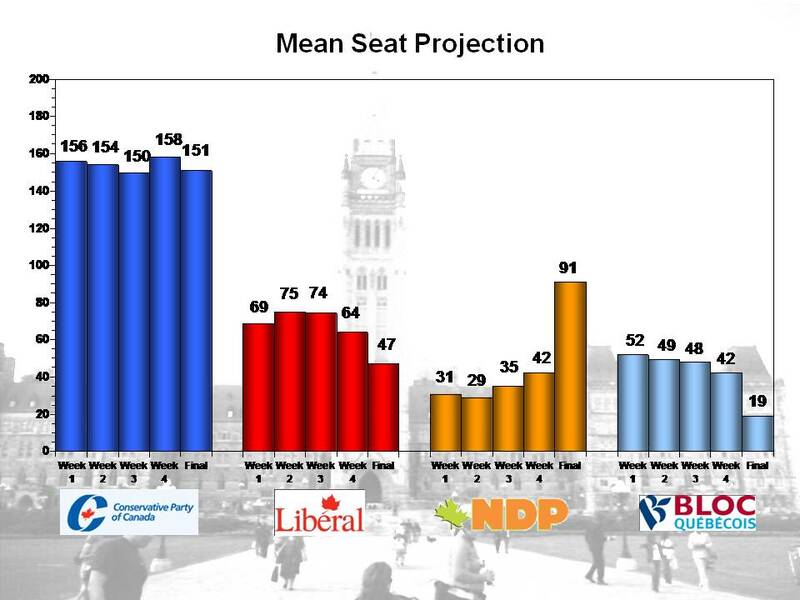 The big issue (if the Liberals come third and I'm still not sure they will) is how many seats the Bloc can hold. If the Bloc can win enough to prop up a minority the Liberals are OK. If the Bloc can't win enough seats to prop up a minority that puts the onus on the Liberals - and having to play with Harper or Layton could make them implode. I don't think the latter is likely. By Anonymous, at 9:09 a.m. I'll throw numbers out just for fun, but I expect a lot of people to be surprised at tonight's results. This whole election moved from "boring and predictable" to "wild and unexpected"! I don't have a deep reasoning on this outside of polls and gut feeling. I'll give the Bloc a bit more points for their ground game, and a higher retention rate for the Liberals as some NDP voters get cold feet at the last minute. May's a bit of a wildcard, but I think she has an honest shot at being elected. By Doctacosa, at 9:17 a.m.
By mezba, at 9:58 a.m. But the how the devil are you going to decide who wins? I could be spot on with the Conservatives and off by 30 seats with the NDP. How about a first past the post system? Award a "seat" for the closest prediction for the Conservatives, NDP,Liberals and Bloc. Then see who (if anyone) has the most seats (i.e. the most closest calls). By Brian from Toronto, at 12:00 p.m.
By Scott, at 12:50 p.m.
P.S. I predict the Greens will win .5 seats and will continue to have a quantum presence in Canadian politics - neither here not there, but both. By Brian from Toronto, at 1:21 p.m.
Chucker is right imo - socially progressice and fiscally conservative works nice. 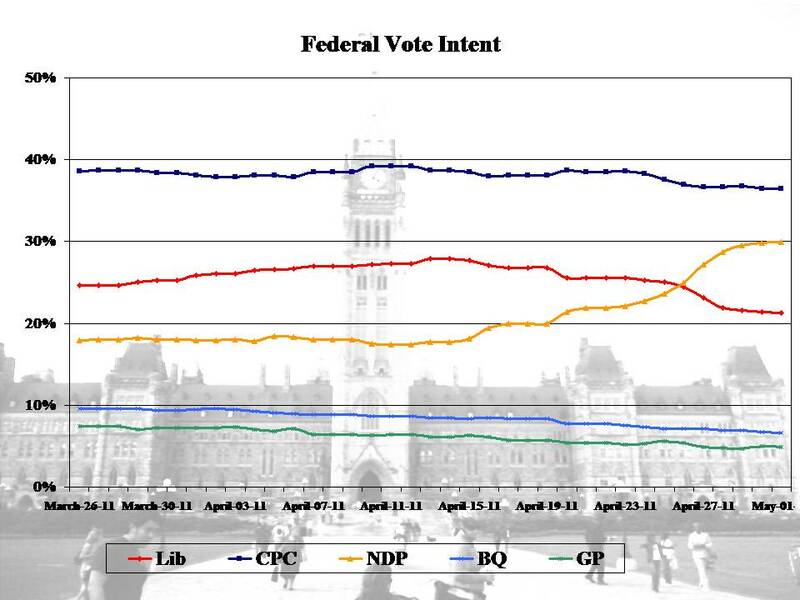 By Jacques Beau Vert, at 2:20 p.m.
By Michael Fox, at 2:37 p.m.
CPC and Bloc go above the polls, NDP below, Libs have some work to do. May wins her seat, Guergis wins hers. By Dennis, at 5:43 p.m.
By Brian from Toronto, at 7:08 a.m. I know that doesn't jive together with the data and also the polls but driving by biking I view it challenging for the NDP to sweep or maybe the Libs to have clobbered. In the event the Libs will certainly get seriously demolished (e.g. 40ish chairs) i think we'll have a Conservative majority. By Buy Old School Runescape Gold, at 2:38 a.m.
By Paul Smith, at 3:22 a.m.
By Cretu Ciprian, at 12:25 p.m.
By Love Kpop, at 5:03 a.m.
By Matlab Programming Assignment Help, at 8:06 a.m.
By Chev Rezpect, at 3:53 a.m.
By Unknown, at 12:52 p.m.
By Sophie Grace, at 1:59 a.m.